Your are an Individual who wishes to showcase your creative art & craft products. You run or plan to run a small social group, society, moot, or clubs (non-profit nature). These days, having a website (extensive or a Brochure site) is vital for anyone reaching out to other people. 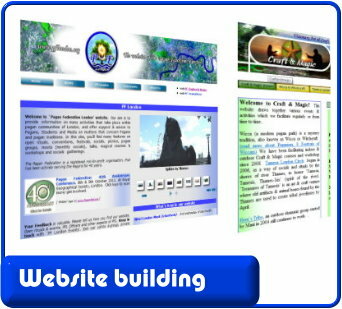 There are many free or low cost softwares available to use by anyone to build your own websites. But not everyone starting such a venture has the technical knowledge, time (or patience) to develop even the simplest of sites. You have to think about domain names, hosting companies, using graphics, copyrights, search engine optimizations, google ranking, social network plug-ins (like putting facebook `like’ boxes) and so many things. Gaian Times can help you with almost all of these aspects, as we have over 7 years of webmastering skills - as our expert has been creating/ running websites for Community organisations, small groups, individuals and money-earning businesses! (Counselling, Property rent, Carpet sales, Art & Craft). WHAT is included in our Offer..
5 separate websites for 5 totally unrelated individuals / home-based business / enterprises entities. Each website GT creates will comprise of up to 5 static pages maximum. video embed (to a video in Youtube..of your choice - your own video or one you choose to promote).. .
Facebook badge: If you have a facebook page/ profile/ group, the website can be linked to it..with a `badge’ ( a small square facebook button). Domain name: GT Director (Mani Navasothy) will register a domain name of your choice - if available (our preferred top level domain extension will be .co.uk or .org.uk which we will provide free. Hosting your website: GT Director (Mani Navasothy) will host your website (at no cost to you, for 1 year!). . Banner / graphics: GT will work with you to provide banner graphics (using a photo, art or graphics you can provide..) Initial banner work can be created by us, of need be. Initial consultations: Initially our webmaster (Mani) will liaise closely with you over a period of 2-3 weeks to plan and create `your website’. If you are in London, a meeting can be arranged in person at a cafe. Or the planning / development can be done over e-mails. Web updates: In the first month, we can accept weekly adjustments in order to fine tune the website. Then we will accept monthly updates.. changing some texts, photos, and minor design adjustments. (but not a full overhaul of the entire website!!) But please refrain from asking for updates more frequently after the first month (every few days or very week! It is not possible). Content/ Copy writing: This is where you provide ALL the words! We will use our expertise to edit and place the words in the best layout possible. But we will not write-up or type-up / create all the words or contents in the first place. . 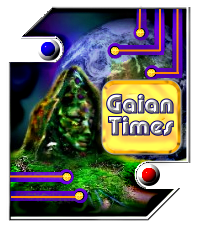 Publicity for GT: You agree by taking this offer, that Gaian times will place a small banner (with link) in the website to promote Gaian Times. Collecting web statistics using cookies: Websites we create automatically have statistics collection (provided by our internet service company) using cookies. This is used to improve visitor experience, site traffic and search engine optimisation for any and all the websites we create and manage. Visitor stats (summary) for `your site’ can be provided for you on request.. Publicity for you: Gaian Times will, where possible, promote `your website’ in many of Gaian Times’ and other related online platforms. Reputation damage /conflict of interests: If material submitted by you for purpose of including in `your free website’ is in any way creating a conflict or possible ill-reputation for Gaian Times or webmaster, the materials in question will not be uploaded, and you will be informed - so that you may revise the material. GT & Mani’s decision will be final. Note on Liability / copyright: GT or any of its Officers/ Directors will assume NO liability or responsibility for the purpose or contents of the website (you must provide the contents.. such as all the written words/paragraphs of the website). Any photos/art/graphics/music/videos you provide to be put on `your’ website is your responsibility and you must hold license or copyright. After 1 year, this free service will come to an end. At that point, you can request Mani Navasothy (not Gaian Times!) to maintain the site & this service, for a fee. (see www.EcoWeaver.com for example fees). Or you may also pay the relevant domain fees & transfer fee, and transfer the domain to your own name... and to your own web hosting provider/ company. This update : 31st August 2013. (Users of this Free offer will be personally notified of any changes to these T&C, and given the option to continue or discontinue with our free offer). Is it about products? A sales site? Art and Craft? A community website for a club? A pagan group? A fan site? A not-for-profit venture? A professional service? An eco-campaign site? Other Activism? Political? (see our legal note in Terms & Conditions). Or is it to promote your self? Your CV? Your personal skills? A network? Promoting your books or other creative items? In accordance with Objectives 3 & 4 of Gaian Times, we are launching our Social Enterprise Initiatives! 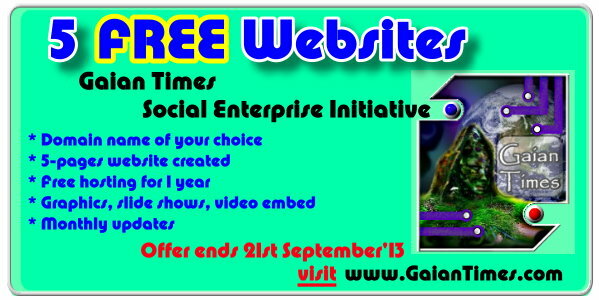 By agreeing to publicise Gaian Times, you can qualify for these. See below for details and T&C. Contact us using our form and tell briefly your website idea/ requirement.. We will contact you soon.